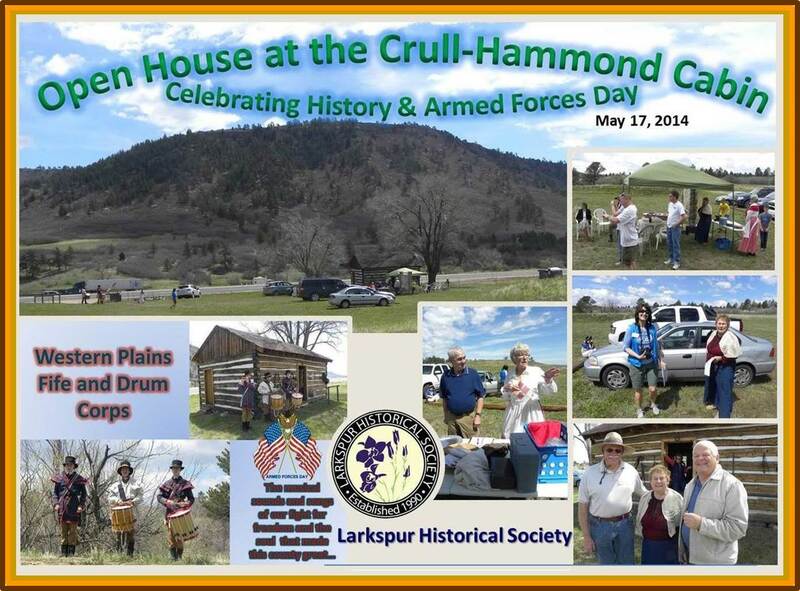 On Saturday, May 17, 2014, Larkspur Historical Society held a celebratory event with a dual purpose …acknowledgment of National Historic Preservation and Archaeology Month and recognition, appreciation and honor of our military men and women during Armed Forces Day. In the bucolic backdrop-setting of Douglas County’s Hunt Mountain, the Society held an open house at the Crull-Hammond Cabin. Attendees of the event enjoyed their exploratory tour of the 1874 Crull Cabin and, with the help of Societal docents, learned a bit of how life at early Huntsville may have been …and, imagined themselves living and working as an early Douglas County pioneer some 150 years ago. The “Whatchamacallit Table” outside the cabin displayed work and cultural articles of the late 19th and early 20th centuries. The “Whatchamacallits” were fascinations for the adults …and, for the children …well, they were a bit mind-bended as they attempted to relate the various items to the present day culture with which they were intimately familiar. Some things just don’t compute! For those of us who served our County in uniform, the music seemingly as simple as Yankee Doodle, stirs the very core of our soul and causes us to remember the determination, courage and heart of those who fought, died and survived to install freedom for our great Country …Freedom, as we all should know, is not free! And, as always at one of these Larkspur Historical Society events, cookies, cake and lemonade were the fare du jour of those in attendance.